On Foot in Spain Walking Tours specializes in small group walking holidays and hiking vacations in Spain since 1999. On Foot in Spain Find out more about cultural anthropologist Nancy Frey and writer, mountaineer Jose Placer, and the 20 year history of On Foot in Spain! On Foot in Spain On the Camino de Santiago tour we bring to life the fascinating cultural heritage of the medieval Camino de Santiago pilgrimage. On Foot in Spain Learn more about the diversity of cultures that have formed part of Spain's history, plus the great range of climates and varied geography. Why On Foot in Spain? A dedication to a personalized, direct experience with the owners of On Foot in Spain is one of the things that sets us apart. On Foot in Spain Walking Tours & Hiking Educational Adventures specializes in small group (7 to 16 people) walking holidays and hiking vacations in northern Spain since 1999. Nancy and Jose personally lead ALL of their walking tours to ensure a high-level of customer satisfaction! We have chosen to keep our business small in order to maintain meaningful contact with all of our walkers in honor of the slow food, slow travel mentality. We truly enjoy traveling with you and sharing our passion for northern Spain and the Camino de Santiago where we met in 1994. 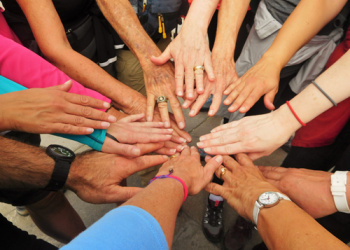 On the Camino de Santiago tour we bring to life the fascinating cultural heritage (art, architecture, history, folklore, flora & fauna) of the medieval Camino de Santiago pilgrimage, aka the Way of St James, from Pamplona to Santiago de Compostela, Spain. You can earn the Compostela Certificate on the Compostela tour walking the rustic trails of Galicia from Leon to Santiago de Compostela. Hiking the stunning, isolated coastal and mountain trails of Galicia: From Sea to Mountain or savor the bounty of sea, land and vineyard on our Galicia: Food & Wine Journey. Walking along the Camino in Portugal (Camino Portuguese) you’ll learn about the culture and rural life first hand. Both the avant-garde and rustic Basque Country walks as well as the emerald, limestone heights found while hiking the Picos de Europa will dazzle for their beauty and stimulate all of your senses. Let us share our Spain with you as friends and traveling companions! 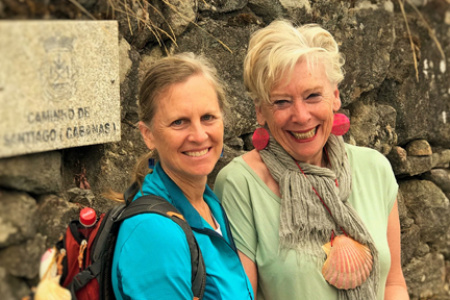 It is difficult to imagine a better way to enjoy Spanish (and European) art, history, culture, and geography than to embark on this magnificent Camino de Santiago tour. "This Pilgrim’s journey was deeper, fuller and richer from the gift of On Foot in Spain"